When Ethan and I went to the Urban Oasis tour in Chicago, we saw some amazing inspirational art and decor. So I wanted to make wall hangings for our bedroom makeover with flavors and elements pulled from the real style makers. I thought they turned out pretty incredible and only cost about $6! When envisioning the room, I wanted a neutral palate, using grays and whites while adding fresh green accents through out the room. The letters on the wall art match the green in the DIY lampshade and our window panels. The idea ended up morphing into very pretty His and Hers artwork, which I love. If you love the His and Hers concept, be sure to check out Dreamsicle Sisters for more canvas ideas with a His and Hers theme. 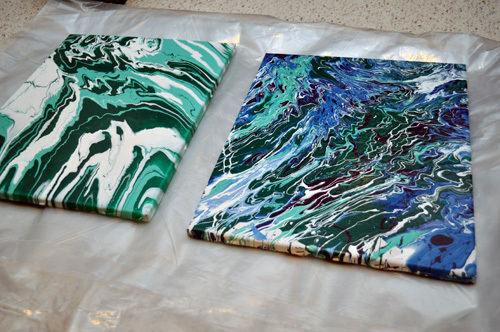 Local thrift stores are a great resource for crafty projects, and I shopped a nearby Goodwill to find a pair of old canvases. It would have been more ideal to find artwork that didn’t have much texture because the texture “showed” through. I was hoping to remove the canvas from the frame, flip it, and use the other side; however, the paint was so thick and plastic-like I could not remove the staples. Perhaps, in the future, I’ll find another canvas to re-do the more textured canvas of the two. 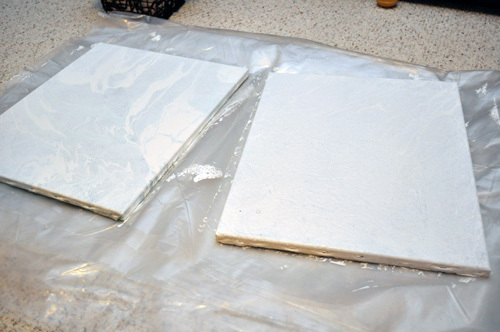 The canvases I purchased are 16″ x 20″. I painted over the old artwork with some spare ceiling paint. I chose a flat paint to provide contrast between the wall paint (eggshell finish) and the paint accent swirls on the canvas (semi-gloss finish). Multiple coats were needed on these because of the dark colors and deep texture. 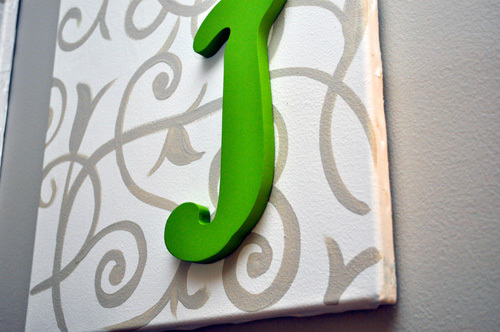 The letters came from Jo-Anne Fabrics and are stuck to the canvas with hot glue. The letters came in black and I used previously purchased craft paint, mixed to match the room. For the swirls, I used leftover Ben Moore semi-gloss paint, the same color as the walls, but a different finish. 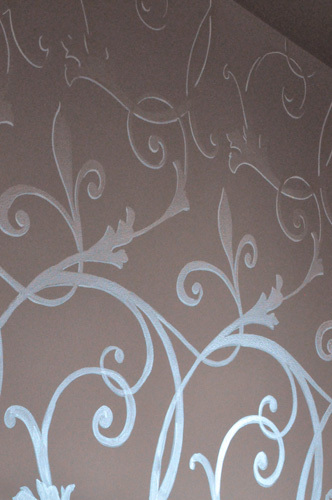 If you didn’t notice, they were inspired by the hand-painted walls in the Urban Oasis bedroom. As an added bonus, I used Command Damage-Free Hanging strips which allowed me to hang the canvases without damaging the walls, especially since it took a few tries to get the positioning the way I wanted. The canvases cost $2 a piece and the letters were $1 each (after sale and coupon). If you don’t have spare paint, that’ll up the price a little. 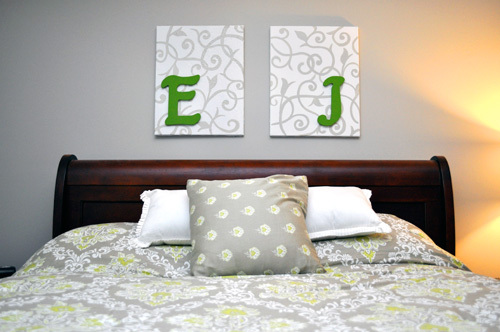 Even so, this is an easy, inexpensive idea for artwork in the bedroom. My wife was _just_ telling me that she wanted to do something like this but somehow incorporating a ‘W’ in the middle. I’ll be forwarding it on to her. Did your wife pencil in the swirls first or just free hand it? It looks really good. Jocie’s really good drawing freehand, and that’s how she made the swirls. It’s something that I’ll never be able to pull off. Send along pictures if your wife does something similar. I’ll add em to the post! Very cute. I love original art work. It personalizes ones home more than anything done by a stranger. Wow, she did a wonderful job on those swirls! I thought at first that she might have used wallpaper. I’m impressed! Great job! 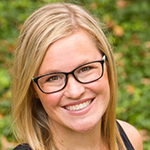 Hey LP, Welcome to the site! Just noticed that this is the first I’d seen a comment from you. I hope you’ll be back to comment often! I can’t believe she free-handed that. I was sure the darker close-up was a stencil and I was wondering where she got it from! This is amazing! I love to personalize wedding shower gifts. Too bad I just went to one…someone else I know needs to hurry up and get married so I can try this out!!! Good post, apparently missed this one the first time it posted. From the first paragraph it sounds like she isn’t happy with the thickness…has she let this project go and decided to live with the thickness of the canvas? That looks great. I love what you did with the paint. Thanks for sharing at DIYbyDesign. Love this design! Just what I’m looking for in a stencil. Do you know if it is one, or is it wallpaper? This was just free-hand. Sorry, I realize thats no very helpful! but i bet there’s a stencil out there. good luck!